Tahirih is an Idaho-raised artist, Owner and Creative Director of Art Party Boise, wife and mother of two who believes that art is for everyone. Creating work from her home-based Eleven Shades Studio, she manifests ideas captured from the æther that is human imagination and is inspired by insatiable wanderlust, grounded only through her love of earth and nature. She has a formal background in fine arts, design, psychology, and developmental therapy. When she is not busy performing her balancing act of entrepreneur/creator/nurturer, you will most likely find her near water or in her garden. To schedule your pARTy with Tahirih, go to bitly.com/partywithtahirih to find available dates and times. Shannon is a multi-media artist. Creativity and feistiness have been an integral part of her life. She is a song writer, teller of tales, and poet of the eclectic variety, as well as a visual artist. Her primary work is being of service to others. She is a certified drug and alcohol counselor and spent many years working with hospice. In 2008, she began doing service work abroad. She and her husband spent several months working and traveling in South America before accepting a Peace Corps volunteer assignment in Botswana Africa where they served for two years. Living back in the States since 2011, she is still finding local adventures and Art pARTy Boise is one of them. As a longtime meditation practitioner, she is working to develop new options in meditative arts. For more information on meditative art practices or to schedule her for your pARTy, go to bitly.com/partywithshannon to find available dates and times. Jessica has over 15 years of teaching art in the private and public school systems. Now that her daughter is off to college, she has decided to pursue art full time and has launched an art business with her architect husband. You can see their professional work at CJ’s House of Art. Art Party Boise will allow her to continue her love of teaching, but on a schedule that gives her time to create. Jessica draws, paints with all mediums, does graphic design and photography. There is no job too difficult. Her work is in offices throughout the valley. She focuses on bringing attention to beauty in the midst of the chaos that floods our lives every day. Through her art, she hopes to influence people to be who they were created to be…beautiful brothers and sisters of humanity. When she is not busy painting or teaching, Jessica loves to escape into the mountains, especially the San Juan Mountain range in Colorado. She hopes to scale many 14,000 foot peaks before her legs and lungs get too old to reach the summits. To schedule your pARTy with Jessica, go to bitly.com/partywithjessica to find available dates and times. 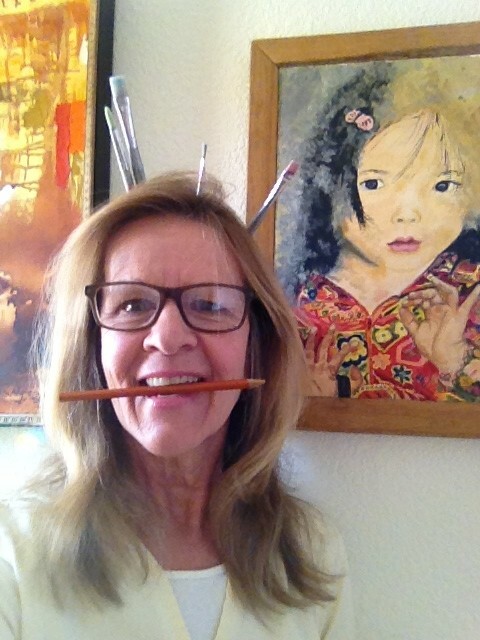 As a part of her lifelong study of all things artistic, she accumulated specialized skill in working with acrylics, oils, and live performance painting, with a particular love of portraiture, charcoal, pencil, ink, vector illustrations, graphic art, and sculpture. As a visionary artist, she offers a unique type of oracle reading that is later transformed into a personal soul portrait or symbolic art piece. Receiving her associates degree in Graphic Design in 2015 has allowed her to help people realize their dreams by offering marketing, branding, and graphic design services. “I am deeply in love with what I do, and am so very excited to create beauty with you!”To schedule your pARTy with Alejandra, go to bit.ly/partywithalejandra to find available dates and times. Pete is a self-taught artist from Los Angeles, CA. He worked in TV Production before moving to Boise, ID in the summer of 2015. He specializes in Pet Portrait work and has partnered with the ASPCA, Idaho Humane Society and local shelters to help fight animal abuse. He is always looking for new ways to create art while benefiting others. If you are interested in checking out his work, visit www.PetPortraitsByPete.com. When he is not painting, Pete manages a coffee shop and coaches baseball. His best friend is a 3-year old pit-bull rescue named Brooklyn. He has joined the Art Party team to lead Gifted® Custom Paint-By-Numbers and help you bring out a style all your own. To schedule your pARTy with Pete go to bit.ly/partywithpete to find available dates and times.